its own to a height over eight feet. Note: Because of the size of this piece, the pictures were more easily made with the clock lying on the floor. 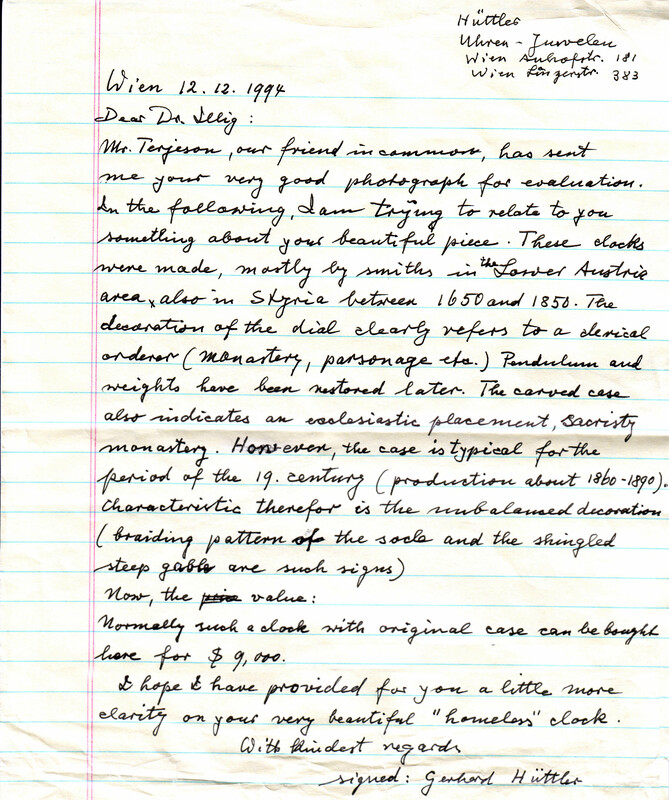 Individual sections were photographed orthogonally. Bought in 1943 in Graz, Austria, by Dr. K. M. Illig (1911 - 2008), from an art and antiques Dealer. Purpose: Timing preparations for mass. The clock stood close to a place in a sacristy where the incense kettle was fired up. Crown of thorns at center of door. 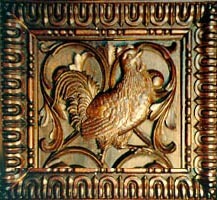 The style of carving is late - renaissance. Height: 8' 8"; depth: 9"; width 13". Function: Chime and movement for daily rewind. When bought, the clock smelt intensely of incense and one can still perceive this odour today. 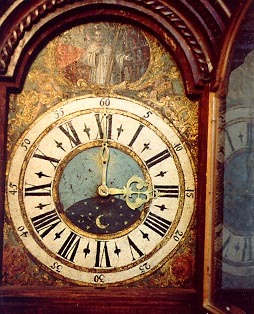 This, and the religious symbols point to the use of the clock in a sacristy (an apartment in or a building connected with a church or a religious house in which the sacred vessels, vestments, etc., are kept). Images: Detail of body | Movement | without "Roof"
When assembled, the clock stands on its own to a height over eight feet. 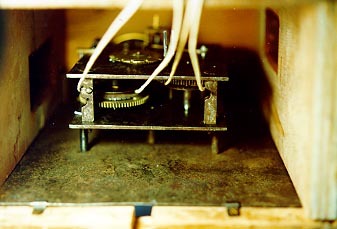 Movement, pendulum and weights (not shown) are included, the clock runs and should be be wound daily. ..."These clocks were made, mostly by smiths, in the Lower Austria area, also in Styria between 1650 and 1850. The decoration of the dial clearly refers to a clerical order (Monastery, Parsonage, etc.) Pendulum and weights have been restored later. The carved case also indicates an ecclesiastic placement, sacristy, monastery. However the case is typical for the period of the 19th century (production about 1860 - 1890). Characteristic therefore is the unbalanced decoration (Braiding pattern of the socle and shingled step gable are such sings)..."
COMMENTS, OFFERS, ARE WELCOME, please email here. This website contains objects of art which are for sale.